Magic submitter is a tool used to build links, which registers accounts and posts content on many web 2,0 and article sites quickly. It has a built in spinner, making use of spun content and can build links to whichever site one chooses. It costs about 67 dollars to purchase in full, but there is a seven day trial version for only 7 dollars. When using the 7 day link version, one’s access is limited. One can only submit to a select few sites during the trial. Even though there have been several evolutions in the working of Google algorithms over the years, Magic Submitter has remained consistent, and the links it builds still work. Magic submitter requires a monthly fee to continue using. However, given the fact that it is updated monthly, this is a good deal. Every month, old sites that are no longer useful are removed, and new ones added to the directory. It posts to web 2.0 sites, social bookmarks and article directories as well as blogs and guestbook sites. Currently, it submits to over 5000 sites actively. Although many of its offerings are similar to other link building software in the industry like SE nuke, it is much cheaper to use. The software also has a 60 day money back guarantee for those who do not like it, as well as the freedom to end one’s subscription at any time. Other tools have 14 day trial periods but only guarantee a 30 day money back period. The extra month on the part of Magic Submitter speaks to their confidence in the software product. There is also the option of a lifetime license for those looking for a longer term commitment. The core of the magic submitter tool is the submitter, but it also has a spinner tool integrated. The magic article rewriter, developed by the same person, directly integrates into the tool. However, one is free to use spinners like Word AI and the best spinner. After spinning using an alternate tool, simply copy and paste the content back into the magic submitter. It can be used for both tier 1 and tier 2 links successfully. In fact, being good at building large volumes, it is perfectly suited to building tiers. It is relatively easy to learn and use, and has a built-in captcha solver. Magic submitter is famous for the amount of time it saves users. All one does is copy and paste, click on a few options and the content is posted to any location one designates the tool to post. One can also schedule promotions to run on any day, or perform them as many times a day as they want. It is a huge time saver, enabling users to send many hyperlinks, all on a single click. However, one needs to make sure the links they build appear normal to the search engines. It allows one to set up a campaign and upgrade it over time, such that there is no risk of Yahoo slaps or penalties from Google’s Penguin. This tool is quite important and unrivalled when it comes to publishing articles in the article directories. This aids a marketing campaign by ensuring that the posts on the directories are facilitated with backlinks which bring the traffic back to the website that a user has specified. This strategy generates traffic and also transforms leads to clients. This is arguably the stronghold of the tool. Magic Submitter is effective in ensuring that content that is posted in the directories has backlinks which will ultimately lead individuals back to a website that the user prescribes. This is what will build clients and also create the desired traffic to the website. This tool is instrumental is facilitating a process whereby a user can target the use of affiliate marketers to drive traffic and increase sales. What affiliate marketers do is advertise content and also build backlinks which consequently directs the traffic the to the site that a user desires. Magic Submitter is perfect for the users who need immediate results in the internet marketing process. This is largely because the tool is able to generate traffic within a short period of time due to the numerous backlinks that are generated. The huge traffic over a short period of time is effective in driving the marketing agenda and is therefore effective for users targeting a trend or a rapid buildup of leads. This tool has a dedicated customer support which is ready to aid with any query or difficulty in the operations. This is a major plus since it ensures the provision of quality and effective service without the hitches that mark the service setting of other tools in the same niche. The unique aspect that Magic Submitter has is that it is able to facilitate a user with the chance to utilize social bookmarkers to create a platform from where an effective marketing campaign can be incorporated. Social bookmarkers ensure that a steady platform is achieved to create extensive marketing with ease. This is a major downside to the operation of Magic Submitter. The tool does not come inbuilt with its own solver which means that a user has to outsource and pay to install one that will aid in the overall working of the tool. As much as it is a good tool for delivering immediate results, the long term effects are surely disadvantageous to a user. This is because the search engines at present have an inclination to punish increased and poor backlink integration. With that said, a bump in traffic may be experienced but will slowly die out as search engines recognize the strategy and decrease the ratings and ranks of the site that has been targeted with the backlinks. 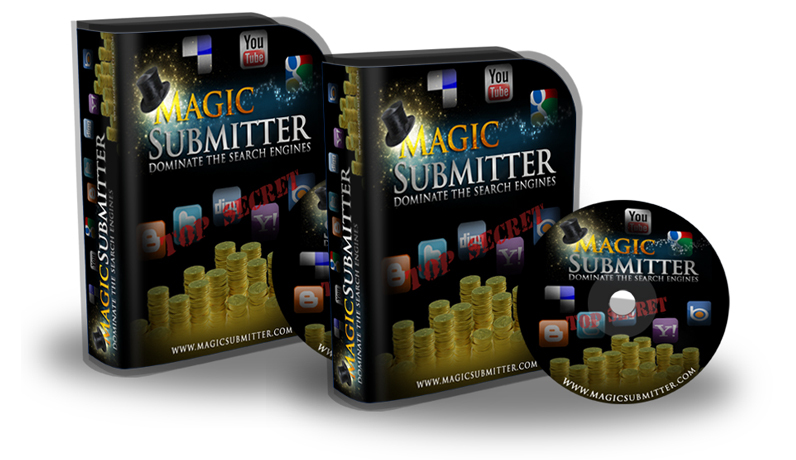 Magic Submitter is one of the tools that has a difficult interface and is therefore hard to learn straight away especially for newbies who are fresh and learning how to adopt the ropes of internet marketing. with no newbie guide, the tool serves as being quite hard to understand and internalize.